Today I am interviewing Alex Lamb, author of the new science-fiction novel, Nemesis, second book in the Roboteer trilogy. DJ: Hey Alex! Thanks for coming back for another interview! For readers who aren’t familiar with you (or missed out on your previous interview) , could you tell us a little about yourself? Alex Lamb: Sure. Well, I’m a dad. I live in Santa Cruz, CA, and I was born in Oxford, England. I’ve had a slightly unusual career that’s involved me doing a bunch of different things. Writing computer software to pay the bills and writing novels for joy have been two constants. Besides that, I’ve been an improv instructor, a communication skills trainer, and a sort of semi-pro simulation scientist working in everything from quantum gravity research, to evolutionary biology, to economics. DJ: What is Nemesis about? Alex: It’s primarily about a young guy called Mark who’s basically the estranged protégé of Will Kuno-Monet, the hero from the first book. Life hasn’t been easy for him. A lot of the projects that Will started after the end of Roboteer haven’t panned out well, including his plan to launch a new breed of super-high-functioning roboteers, of which Mark is one. Mark has a lot of edgy tech in his body that he’s not allowed to talk about and by this point a pretty bitter relationship with both Will and the government that helped create him. About thirty years have passed since the war in the first book, and society as reached another turning point. War is on the brink of breaking out again. And into this volatile mix comes word of a violent attack on a politically sensitive outpost that may or may not be due to aliens. Today I am interviewing David L. Golemon, author of the new science-fiction thriller novel, The Traveler, eleventh book in Event Group Thriller series. DJ: Hey David! Thanks for agreeing to do this interview! David L. Golemon: Thank you DJ for having me. David L. Golemon is not a very complicated person to get to know. I raised three great children on my own since they were very small, so I actually do know the horrors and fears of parenting. I am a veteran of the United States Army and former manufacturing specialist for a few of the larger corporations in the world. After many years of the real world, I felt it was time to move on and create worlds of my own, worlds I can more readily understand more than the one in which we live, thus, here I am many years later still developing that new world, and to be honest with you DJ, a world which is far better to handle than the current real world we find ourselves. DJ: What is The Traveler about? Today I am interviewing Robert Repino, author of eme new science-fiction novel, D’Arc, the latest book of the War with No Name series. DJ: Hey Robert! Thanks for agreeing to do this interview! Robert Repino: Thanks so much for talking with me. The short version is that I grew up outside of Philadelphia, where most of my fiction takes place. After college, I spent two years in the Peace Corps in Grenada, and then earned an M.F.A. in Creative Writing at Emerson College. I currently live in New York, where I work as an editor with a scholarly publisher, and I occasionally teach creative writing classes with Gotham Writers Workshop. DJ: What is D’Arc and then the War with No Name series about? Robert: In short, the series is about an apocalyptic war between humans and sentient animals. In this world, the nearly immortal Queen of an ant colony tries to wipe out all the humans. In their place, the animals rise up and build a new civilization. In the aftermath of the war, a cat named Mort(e) searches for his long lost friend, a dog named Sheba. Spoiler alert: he finds her, and D’Arc picks up from there. In the sequel, Mort(e) and Sheba try to live the quiet life on a remote farm. But soon, they get pulled back into the conflict—largely because Sheba yearns for a life of adventure. Today I am interviewing Ryland Thorn, author of the new grimdark fantasy novel, Blood, first book of The Fae-Born Narratives. DJ: Hey Ryland! Thanks for agreeing to do this interview! Ryland Thorn: Thanks, DJ. What would like to know? I’m a long-time fantasy fan who grew up reading people like David Gimmell and Raymond E Feist and Orson Scott Card, and always knew that I was going to be a writer. To begin, with that meant writing millions of words in the corporate world, but that was really boring! So I’m now back doing what I always wanted to do, which is to write fiction. I’m lucky enough to have been accepted into the groundbreaking Phoenix Prime author program, which is leading a fundamental change in the digital publishing world. Other than that, I live in the spectacular Nelson region of New Zealand with my wife and a couple of cats, I spend most of my waking hours in front of the computer, and I like to get out and go kayaking or for a ride on my bike. What is the cost of revenge? 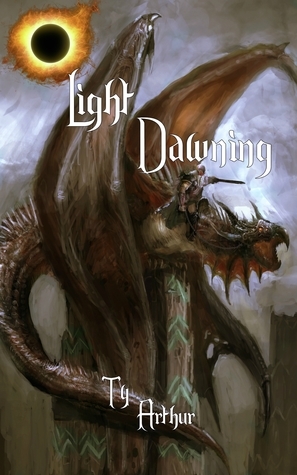 Overwhelmed by grief and hate, Marin Terrell is an empath who joins a company of soldiers to hunt down the wyverns and dragon that murdered his master. But when the soldiers manage to corner one of the wyverns, the outcome is awful. Haunted by visions of blood and monsters and his own painful death, Marin starts to have second thoughts. He wants to abandon the quest, but the leader of the soldiers is a tyrant who gives him no choice but to go on, no matter the peril. Will they find the creatures they hunt? And if they do, how will Marin find a way to survive the carnage that will ensue? What isn’t in the blurb is that Blood is the first of the novel length stories in the Fae-Born Narratives, but I have written a few short stories in the series as well. The idea is to create a world of complexity and depth that I’m hoping people will enjoy. Today I am interviewing Isabelle Steiger, debut author of The Empire’s Ghost, the first book in a new epic fantasy series. DJ: Hey Isabelle! Thanks for agreeing to do this interview! Isabelle Steiger: This is the very first piece of writing I’ve ever gotten published, so I don’t imagine many readers are familiar with me. I was born in New York City, and I moved back there when I started college, after a ten-year stint in the country. When I was a kid, I used to take a notebook up to the highest hill by my house to write, but these days the diner on the corner serves just as well. DJ: What is The Empire’s Ghost about? Isabelle: A dictator calling himself Imperator Elgar has already conquered half of the continent of Lantistyne, but he won’t rest until he rules it all. He’s determined to recreate Elesthene, a continent-spanning empire that history paints as both majestic and terrifying. The novel follows the struggles of two different groups of people: the rulers of the countries Elgar has yet to conquer, who are desperate to find a way to defeat him, and a found family of not-quite-law-abiding commoners trying to keep themselves and each other safe after Elgar decides he wants to use their skills for his own ends. DJ: What were some of your influences for The Empire’s Ghost and the series as a whole? Today I am interviewing C.A. Higgins, author of the new science-fiction novel, Radiate, final book of the Lightless trilogy. DJ: Hey C.A.! Thanks for agreeing to do this interview! C.A. Higgins: Lightless was my first book, written while I was in college studying physics. After I graduated I decided to write novels and work in theater, just like my parents always hoped, but I still have a great interest in both science and science fiction. DJ: What is Radiate and then the Lightless trilogy about? C.A. : In the first book, Lightless, the small crew of a top-secret and highly advanced military spacecraft (the Ananke) discover a stowaway aboard their ship. They quickly learn he has connections to a terrorist (the Mallt-y-Nos) determined to overthrow their dystopian society, but the stowaway—Ivan—isn’t as helpless as he may seem. Meanwhile, the Ananke itself has been acting strangely, almost as if it were trying to communicate. Today I am interviewing Julie rafzerneda, editor of the new anthology, Nebula Awards Showcase 2017. DJ: Hey Julie! Thanks for stopping by to do this interview! Julie Czerneda: Hello! Like your readers, I love science fiction and fantasy. I’ve been writing my own since I was ten. In one of those odd twists careers can take, I went from biologist to professional non-fiction author and editor. My first SF anthology as editor was Packing Fraction and Other Tales of Science and Imagination, which came out in 1999 from Trifolium Books. Not surprisingly, it was intended for science classrooms and I wrote an annotated guide for educators No Limits: Developing Scientific Literacy Using Science Fiction. This was about the time my own fiction writing took off, and I’ve been doing that full time ever since, proud and delighted to be published by DAW Books NY for (gasp) twenty years. Between the novels, I kept doing anthologies because how better to learn the craft than read wonderful authors? The Showcase is my sixteenth. DJ: What is Nebula Awards Showcase 2017 about? What are some reasons readers that readers like to pick it up? Today I am interviewing Andy Lane and Nigel Foster, authors of the new fantasy novel, Netherspace, first book in the Netherspace series. DJ: Hey Andy and Nigel! Thanks for agreeing to do this interview! Andy Lane: I took a degree in Physics and spent twenty seven long years working for the British Ministry of Defence, largely providing scientific advice and analysis to the Army and the Air Force and working on predicting the shape of future warfare. In my spare time I’d been building up a parallel career as a writer, given my life-long love of writing science fiction. A few years back I left the Civil Service and went freelance, which was (next to asking my then-girlfriend to marry me) the best decision I’ve ever made. Nigel Foster: Former soldier, Intelligence Corps, then advertising, PR, tv and radio all over the world, then journalist and author. So your average media gypsy. Wrote a best-seller about the Royal Marines Commandos, also developed and launched OK! Magazine. Weird combination, I know. DJ: What is Netherspace about? Andy: It’s about 90,000 words. No, I kid. It’s about a universe where communication between races is impossible – we’re all just too different. It’s about the various accommodations that have to be made in order for us all just to get along, and what happens when we reach the limits of those accommodations. It’s also about the J.B.S.Haldane quote: “It is my supposition that the Universe in not only queerer than we imagine, is queerer than we can imagine.” How do we, how can we, live in a universe that we don’t, can’t, understand? Today I am interviewing Tarn Richardson, author of the new horror / historical fiction novel, The Risen, final book of The Darkest Hand trilogy. DJ: Hey Tarn! Thanks for agreeing to do this interview! Horror? Historical Fiction? How exactly would you describe The Darkest Hand trilogy? TR: Hey DJ! Yes, there’s quite a mix of genres within the books! They’re hard to define. The trilogy could be called horror, but it’s quite ‘measured’ horror I suppose. The nasty bits are there for a reason, not simply to be gratuitous for the sake of it. There’s a lot of historical backdrop (of World War One), the wars and its events heavily researched by me before writing, details of the actual battles and specific theatres of the war. There’s a thriller aspect to the books, particularly books two and three. And a paranormal crime slant, as well. I tend to describe it as ‘Dark Fiction’. That covers all bases! TR: I live in England, near Salisbury, not far from Stonehenge! I’ve worked as a copywriter and have written Murder Meal Party Games. In 2012, I travelled to France and Belgium on the trail of a Great Uncle who went out to fight in WW1 and never came back. Whilst there, the idea for The Darkest Hand trilogy planted its seed and then grew within me. In 2015 the first of the books of the trilogy, THE DAMNED, was published by Duckworth Overlook and by Overlook Press in 2016, THE FALLEN following a year later. DJ: What is The Risen and The Darkest Hand trilogy about? TR: The Darkest Hand trilogy is an epic story set in the backdrop of the First World War. The Catholic Inquisition, still strong but now working in the shadows, sends its most powerful, but flawed, inquisitor, Poldek Tacit, to investigate the murder of a Cardinal within the city of Arras at the start of the war. Teaming up with the beautiful Sister Isabella to solve the crime together they uncover a dark conspiracy that leads to very heart of the Vatican and beyond. THE RISEN, the final part of the trilogy, sees our heroes face Russian revolution and the rise of the Antichrist in the closing phase of the war, searching for a way in which he can be defeated before he assumes ultimate power within the world and casts it into endless dark.